Mtbr.com Bike Shop Reviews - Promote Your Shops Ratings and Reviews! 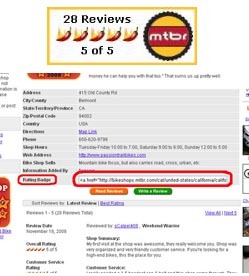 Mtbr.com has long been known for its product reviews and trail reviews. But for the last couple of years, the number of bike shops listed in our Bike Shop Reviews section has grown to over 1800 listings. And the number of reviews has continued to grow, strengthening this section of the site and solidifying it as a valuable resource for our users and bike shop owners. Another advantage of promoting your bike shop listing on our site, is to encourage users to submit their reviews on our site and, if your site gets enough reviews, it just might be in the running for next years Best Bike Shops - Highest Rated Bike Shops on Mtbr.com! Thanks for your help in creating a better resource for ALL mountain bikers. Mtbr.com Provides The Best Sea Otter Classic Coverage...Period. Mtbr.com and RoadBikeReview.com Provide the Most Extensive Coverage of Interbike - Be a Part of It!